Information that is entered for a lien holder will be displayed when that lien holder is selected for a sale. •LIEN HOLDER CONTACT INFORMATION – The initial information that you enter for a lien holder is general business information for them such as address. •AMOUNT TO RECEIVE FROM LIEN HOLDER – The system provides options that determine how much you will receive from the lien holder on a deal. You can enter a percentage, define if the balance will include or not include finance charges, as well as capturing any additional fees. •ADDITIONAL COSTS – The system provides options for defining who pays for costs including service contracts, insurance, and other fees. For all of these you can select whether it is a dealer or lien holder cost. •PICK-UP NOTE – There is an option for selecting whether the lien holder will also buy the pick-up note. •ACTIVE STATUS – There is a box to designate whether a lien holder is active or inactive. To select a lien holder that is inactive, you will need to change the display field on the Lien Holder File screen to ALL. The default for this field is Active which will only display active lien holders. •PROFIT ON MARK UP FROM BUY RATE TO SELL RATE – You may earn additional income by charging your customer a higher Annual Percentage Rate (APR) than the bank charges you. For example, the bank may tell you that they will finance your customer at 8%. You then charge your customer 10%. You then get to keep some or all of the extra interest earned from the 8% to the 10%. Do not check the "Ratio Method" unless your bank specifically tells you that they are using this method when calculating how much they earn. See Reserve Calculation for more info. •LOAN ORIGINATION FEE/BANK PROCESSING FEE – Your financing source (the outside lien holder) may require that you charge your customer an up-front fee. This processing fee, or pre-paid finance charge, must be entered on this Lien Holder Tab, and not on the Pricing Tab. •OPTIONAL SALES FEES – The optional sales fees that you enter here will be displayed on the sales processing screen when completing a sale. 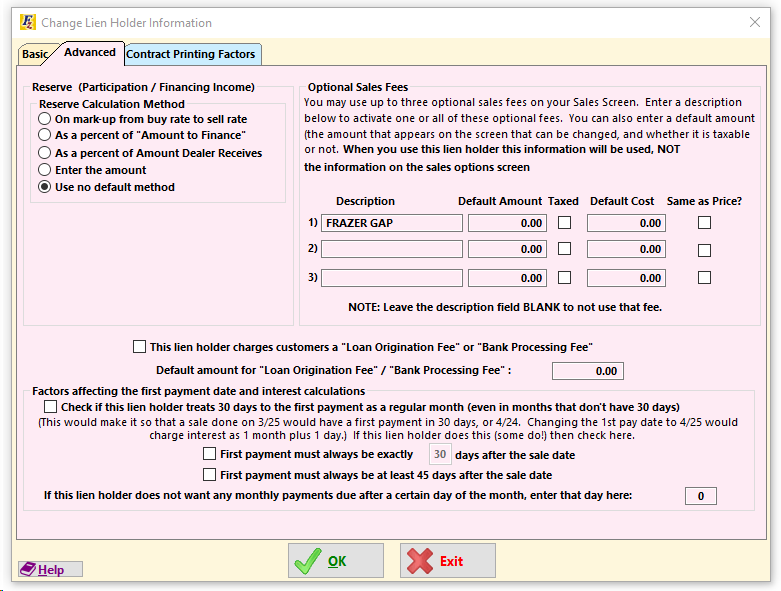 When you create a new lien holder, this section will be populated with any sales fees that are included in the system options. 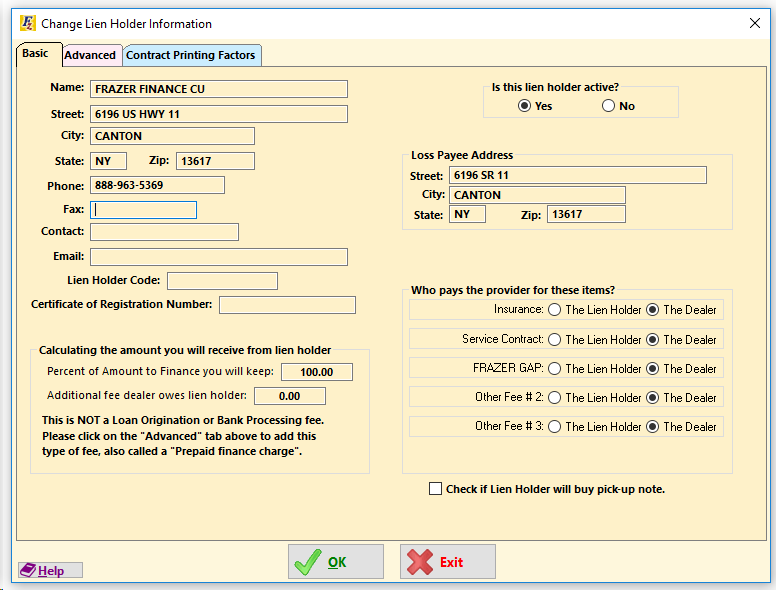 If you need to modify them for a specific lien holder you can just make the change in this lien holder file. These options only apply to printing the contract for a specific Lien Holder. •LATE FEES – This Lien Holder may have specific details related to Late Fee's that need to print on their contract, that are different from the way your system options are configured. You can enter that here. 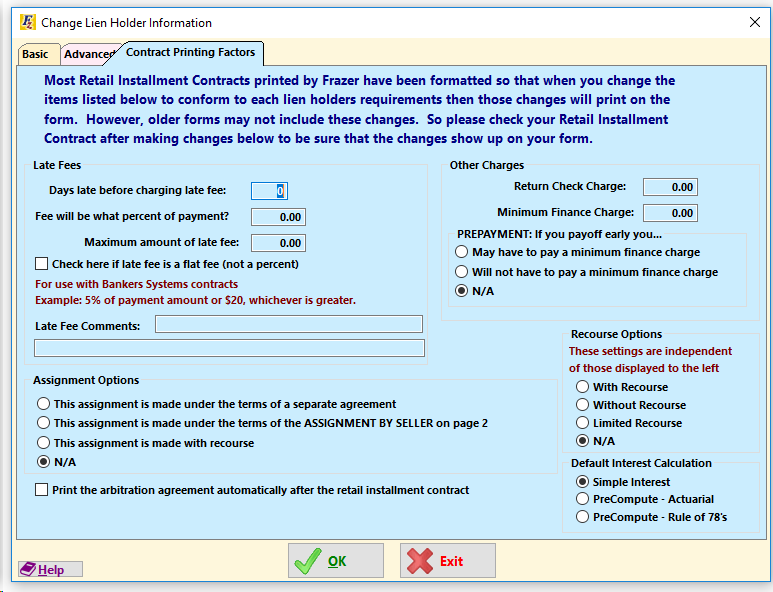 •ASSIGNMENT AND RECOURSE OPTIONS – The Contract for this Lien Holder may also have specific requirements for the Assignment and Recourse section. •Select SALES at the top of the main gray FRAZER screen. •Select Option 5 Lien Holders. •Select the Lien Holder Tab. •Click on the Select Lien Holder BUTTON. •Click on the Add Lien Holder BUTTON.